The Yellow Emperor, also referred to as the Yellow God, Yellow Thearch, Yellow Lord or his Chinese name Huangdi, is a supernatural being in Chinese religion. He is considered one of the legendary culture heroes and Chinese sovereigns included among the mythohistorical Five Emperors and Three Sovereigns. Huangdi reigned almost 5000 years ago and was regarded as the initiator of Chinese civilisation and credited for inventing the earliest form of football. Developed by Microgaming, Huangdi: The Yellow Emperor video slot is based on the story of this mythical sovereign of ancient China and is recognized as a national icon in modern day China. The Yellow Emperor video slot is presented across 5 spectacular reels with three rows and features 25 historic pay lines. The background takes place in ancient China with several hazy mountains and Chinese temples scattered behind the reels under a clear blue sky while the reels received an ornate frame to compliment the setting. The symbols are all related to the historic battle of Zhuolu. Huangdi was victorious against the Nine- Li Tribe and includes medicine boxes, musical instruments, the sword of Huangdi and Huangdi himself paying the highest jackpot bonus worth 1,000 coins. The remaining symbols include Chinese calligraphy-styled symbols from a deck of playing cards ranging from Ace through to 10. Huangdi: The Yellow Emperor slot machine is available on a wide selection of different platforms including PC's, MacBook's, Tablets, and mobile devices like iPhones and Smartphones, so you can enjoy this fantastic slot game while on the move. The Yellow Emperor video slot is offered to all Canadian players and slot enthusiasts from around the world, and there's no need to add funds to your casino account to see what this game is all about as numerous online casino sites offer a demo version or free play slot version of the game. In addition, there is no download and no registration required to enjoy a glimpse of this legendary game before making your way to the banking page and purchasing credits to potentially walk away with a lucrative amount of winnings. The 25 pay lines of this video slot are permanently fixed and cannot be altered in any way, meaning the minimum bet per spin is $0.25. The slot game also allows for some serious high bets with the maximum bet per spin set at $125.00, making it perfect for high rollers to take advantage of this low variance slot game. Huangdi: The Yellow Emperor free play slot comes with a return to player percentage of 96.50%. Huangdi: The Yellow Emperor boasts two bonus symbols including the game's logo acting as the wild symbol, standing in for all other symbols except the scatter symbol. The second bonus symbol is the golden dragon representing the scatter symbol and unlocks the main feature in the game. There are also two interesting special features such as the expanding symbols feature that is activated when you manage to display a full stack of high valued symbols on reel one during the base game. Thereafter, all matching symbols displayed on the remaining reels will also expand to provide some potentially huge wins. The second special feature is a free spin round triggered by displaying three or more golden dragon scatter symbols anywhere in view where you will be rewarded with 15 free spins. The expanding symbols feature will also occur during the free spin feature and any wild symbols displayed will also expand for additional winning opportunities. Extra free spins can be activated by landing three more golden dragon scatter symbols. 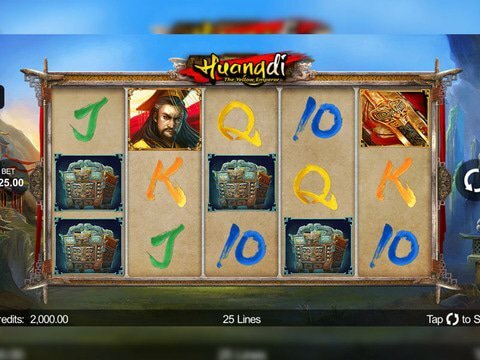 Huangdi: The Yellow Emperor slot machine is a compelling oriental-themed video slot with sensational animations, graphics, and superb sound effects to keep you well-entertained for hours on end. The special features will provide some huge wins, and with a low variance setting, you can really walk away with a lucrative amount of cash rewards. Our review tells of a wonderfully story of times that are steeped in history, and another fine representation of this era is Asian Beauty, a Microgaming video slot designed around the ancient art of the Geisha. It offers a bonus game, wild symbol, scatter, free spins and the opportunity to win up to 40,000 coins. A fine and highly recommended casino offering Huangdi: The Yellow Emperor slot machine is Maple Casino, an online casino built for Canadians, it offers a welcome package consisting of 30 free spins, up to $500 in cash bonuses plus to help you on your way to loyalty redemption, 250 loyalty points. With over 500 games at your fingertips, this is the place to play, thanks in part to its professional and dedicated support team, daily, weekly and monthly promotions as well as fast processing of winnings.